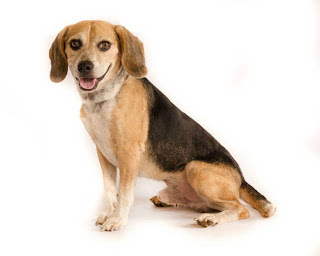 One thing I've discovered since starting this blog is there are lots of beagles online. So each week we're going to introduce you to a new beagle and their parent to check out. We'll also feature a beagle who needs a home. Our first Beagle of the Week -- Bru! Bru as a puppy and Bru today. Bru belongs to Holly Rose, who runs a blog called Home Bruing, which is a product review and DIY site. I've been lucky enough to practically watch Bru grow up through Holly's pictures. Isn't he adorable? 1) How old is Bru? Bru was born April 15, 2012. He's almost 1 year, 4 months. 2) Where did you get him? 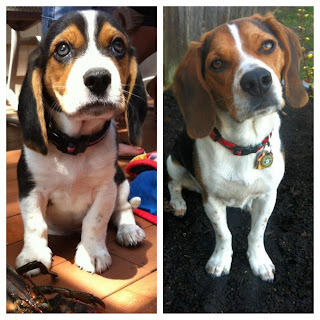 We adopted Bru from a small family in VT that had a litter of beagle pups. 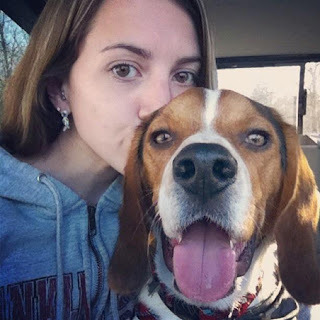 The father was an active hunter, so both of Bru's parents are hunting beagles! He looks JUST like his mom! We drove 3 hours there, 3 hours back to get him! 3) How old is he, and how long have you had him? He's 1 year, 4 months. We've had him since he was 7 weeks old! 4) What's his favorite food? What ISN'T Bru's favorite food? He goes nuts for wet foods, forbidden people food, treats, peanut butter and more. We've tried giving him veggies, but he just likes to mash them up into my rug for me to clean up. 5) What's his favorite thing to do? Bru LOVES to go hiking. You should see him "catch a scent," as we call it. He'll start whimpering and pawing around trees looking for squirrels, rabbits, and who knows what! He must get it from his mom and dad. He likes to walk the perimeter of our backyard and stalk/chase robins, too. 6) What's his favorite toy? Bru's favorite toy is his stuffed koala. The family we adopted him from said he loved to snuggle it. It used to be bigger than him and he would sleep on it like a pillow. Now that he's bigger, the koala has become his "girlfriend!" He has a special romance with her and loves to lay down with his mouth on her. It seems to relax him! She's lost minimal stuffing over the past year. We think he's less rough with her to keep her around longer! 7) Does he take part in any special activities (i.e. therapy dog, service dog, spokes dog, etc.) ? No, but he passed his Basic Obedience training class at Petco Unleashed. I'd love to bring him to a nosework class someday! 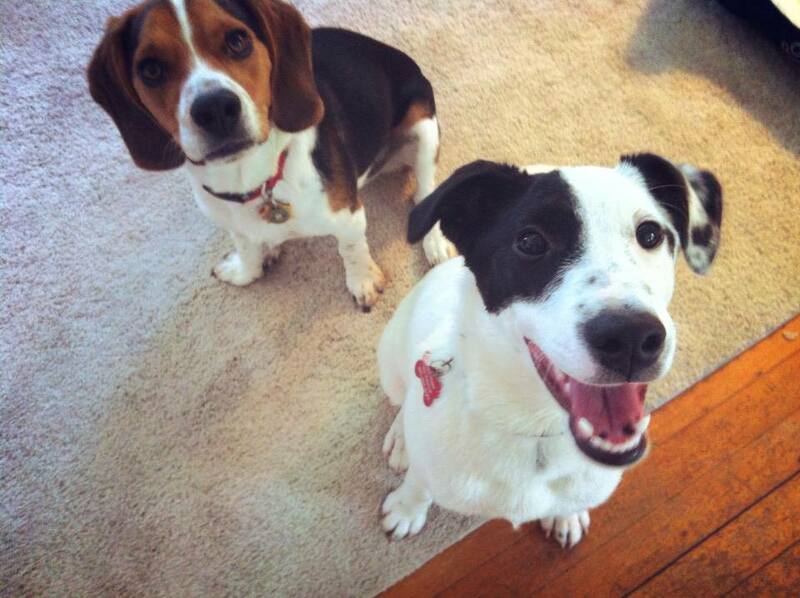 "Bru had 3 foster brothers since March, and all have been adopted! We're taking a break right now, but plan to foster again soon. He loves to romp around with foster siblings! Our first foster, a 3-year-old basset hound, was finishing up heart worm treatment and Bru seemed so sweet to him and gave him lots of kisses and snuggles!" 8 ) What's the best part about owning a beagle? The best part of owning a beagle is their loyalty and love. There's nothing like a wagging, happy whining beagle to greet you when you come home and to snuggle into you at night. He's like a little shadow, following us around the house!! The worst part about owning a beagle is their wandering nose. We've yet to fully fence in our yard, and he has gotten out of our sight a few times. Bru loves to go for a stroll down the block and make his mom and dad worry! Follow me and Bru at www.homebruing.com for product reviews, DIY projects and other adventures! So that's Bru! It's amazing what can happen when a pup has a great home! I wrote about Shoeshine and Buck earlier this week. 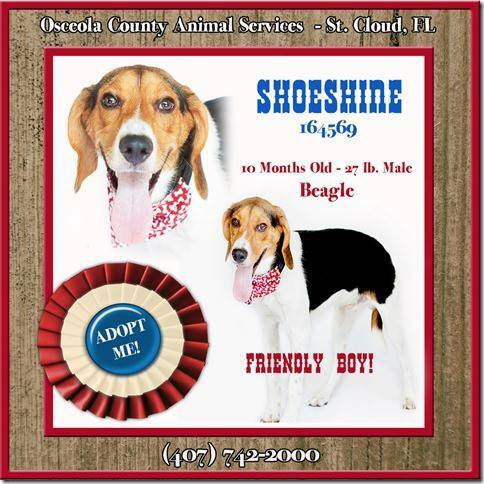 Both beagles are still at Osceola County Animal Shelter. Shoeshine has been there for weeks. The shelter is at capacity, which means Shoeshine especially is in danger of being euthanized! 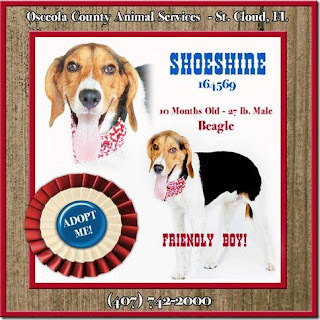 Please help spread the word about Shoeshine and Buck, and lets see if we can find these beagle boys homes! HAHA I love the answer to #4! So nice to meet you Bru! Bru is adorable! Paws crossed that Shoeshine and Buck find a forever home. Hello Bru! What a sweetie. We are at our city's max for animal companions (two beagle boys and a kitty baby). Gonna tweet this about Shoeshine and Buck. You never know who might see it.